Magnetic Flux Leakage (MFL) and manual Ultrasonics (UT) have been used extensively for the detection and sizing of corrosion pits in ferrous plates and pipes. Users and providers of these inspection services may have different perceptions and expectations of the sensitivity and accuracy of the methods. This paper discusses the underlying principles of the methods and their effect on Probability of Detection (POD) and accuracy. There are many types and mechanisms of corrosion but in this instance we deal exclusively with corrosion that is typical between the pad and the underside of tank bottoms or from water contamination inside the tank. The ultrasonic means of detecting erosion in pipework was so successful during the 1960's that it has given a false impression of the accuracy that will be obtained with pitting type corrosion. To help appreciate the difference we will illustrate erosion and some typical pit shapes. Figure 1 shows erosion whereas Figures 2 to 4 sketch corrosion shapes that have been given the terms "Lake Type", "Cone Type" and "Pipe Type". 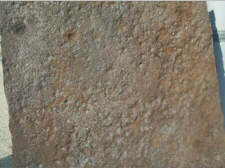 Figures 5 to 8 are photographs of erosion and typical corrosion of the lake and cone type. It is interesting to note the steps or 'terraces' formed as the corrosion progressed. Lake and pipe types of corrosion are most commonly found in storage tank floors. They are usually the result of moisture ingress between the floor and the pad (underside) or water in the product (topside). Pipe type pitting is relatively uncommon and is usually associated with water droplet erosion or Sulphur Reducing Bacteria (SRB). The principles of both the MFL method and the UT method have been described in detail elsewhere. For the purposes of this paper these are briefly summarised here. Figure 9 illustrates the basic principle of the MFL method. 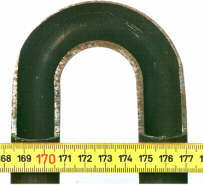 A magnet mounted on a carriage induces a strong magnetic field in the plate or pipe wall. In the presence of a corrosion pit, a magnetic flux leakage field forms outside the plate or pipe wall. An array of sensors is positioned between the magnet poles to detect this flux leakage. The sensors are usually Hall Effect devices or coils; there are advantages and limitations with either type of sensor. Figure 10 illustrates a simple UT set-up using the pulse-echo principle and a twin crystal probe. In this configuration one crystal acts as transmitter and the other as the receiver. The transmitter is isolated from the receiving circuits so that the A-scan display is freed from the presence of a transmission signal. As a result the transmission pulse does not obscure the first back wall echo when testing relatively thin areas of plate or pipe. We shall see that simple digital thickness meters without an A-scan facility are not suitable for either detection or measurement of pitting. PROBABILITY OF DETECTION - MFL. The MFL method uses an array of sensors such that each sensing field overlaps with its neighbour. The probability of detection of any flux leakage signal depends on the amplitude of that leakage field in relation to any noise signals. In other words, the signal to noise ratio is the primary factor governing detection. Some of the parameters affecting the signal to noise ratio are related to the equipment design and performance, and some are related to the floor condition including the geometry of any pitting. The magnet must be strong enough to achieve a flux density in the material being tested that is close to saturation. The carriage design must be such that the magnet system can ride any undulations in the scanning surface without too much variation in the gap between the magnet poles and the test surface (lift off). Clearly, one advantage of using Electro-magnets is that the magnetising force can be adjusted to compensate for different material thicknesses and lift off changes. A practical advantage is also that the magnetic field can be switched off to aid removal of the scanning head from the test surface. The major disadvantages are size and weight. For this reason many scanners resort to permanent magnets using Neodymium - iron - boron in the magnet design. The result is a compact scanning head suitable for wall thicknesses up to 12.5 mm, or, at reduced sensitivity, up to 20 mm. Greater thicknesses could be achieved provided that a suitable and safe system to place and remove the carriage from the test surface is devised. Two types of sensor are in common use, coils and Hall effect devices. In either case the spacing between adjacent elements in the array must be small enough to ensure that there are no gaps in detection across the array. If sensors are arranged in differential pairs for noise cancelling purposes, the layout should take into account the fact that the leakage field may extend 3 or 4 times the diameter of the pit across the array but only about the diameter of the pit in the scanning direction. The voltage signal generated by a given leakage field in a coil sensor is a function of the rate of cutting lines of force. This will be a function of the number of turns in the coil and the forward speed of the scanner. Thus the coil type of sensor is speed sensitive and this should be taken into account in the equipment design. Coils are also more sensitive to lift off variation than some configurations of Hall effect devices. One distinct advantage of the coil sensor is that it appears to be less affected than Hall effect devices by the strong eddy current signal that is generated during the acceleration and deceleration phases of the scanner. Hall effect devices are in principle less sensitive to speed variation, however when filtration is used during signal processing to remove low and high frequency spurious signals, the resulting band pass window imposes some restriction on speed variation. When these devices are arranged to detect the Horizontal component of the leakage field, they are relatively insensitive to the eddy current signal mentioned above, but, like the coil, relatively sensitive to lift off variations. When arranged to detect the Vertical component, they are less sensitive to lift off variations but very sensitive to the eddy current signals. One advantage of this arrangement, however, is that a larger gap between the sensor housing and the test surface can be accommodated which reduces housing wear and allows the housing to clear some of the surface imperfections such as weld spatter. Some degree of speed control is necessary with all types of sensor but there is less latitude when coils are used. One source of background noise and false indications is due to surface roughness of the scanning surface. This is very common in the case of storage tank floors and above ground pipelines that have not been coated. The resulting corrosion on those surfaces causes the scanning carriage to vibrate the magnet and sensor system. The resulting noise can be reduced in three ways: by fitting broader wheels, by incorporating shock absorbers and by signal processing since the vibration frequency is likely to be higher than that from pit signals. The signals from leakage fields are relatively small and need amplification. They also need to be discriminated from unwanted noise. Band pass filters are used to remove the low frequency (eddy current) and high frequency (vibration) noise. Any residual noise can be countered by the use of thresholds set on the defect detection circuit or, in the case of dynamic detection notification displays, by the operator assessing the general noise level. Autostop. The scanner automatically stops when a defect is encountered and a visual display indicates which sensors in the array have detected the pit. The scanner cannot be restarted until the operator has cancelled the indication. The operator marks the floor so that pit depth measurement can be performed. Dynamic display. The operator views a dynamic display indicating the current status of signals across the array. A signal above the general noise level indicates the presence of a pit. In these systems the operator may be assisted by an audible or visual alarm which triggers above a pre-set threshold. The operator marks the floor so that pit depth measurement can be performed. Computer data acquisition. Some systems use a computer to store data from the inspection for subsequent analysis and reporting. This may include software to allow mapping of the tank floor with colour coded indications of material loss. The operator can access the data at the end of each scan in order to mark the floor so that some cross checking of results can be performed. The scanning surface should be clean and free from debris (particularly from corrosion products that may have fallen from the tank roof). Surface roughness may cause vibration noise requiring a relatively high threshold to be set (reduced pit sensitivity). In some cases laying a thin sheet (circa 1mm) of plastic over the scanning surface can alleviate this. 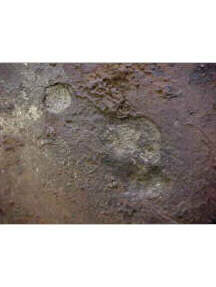 Other anomalies such as weld spatter or weld repairs that have been ground flush will give large false indications. It must also be remembered that the MFL method does not discriminate between pitting on the scanning surface and that on the remote surface, however, for pits penetrating 50% or more through the material, the MFL method is more sensitive to remote surface pitting. One major advantage of the MFL method is that it is able to function with relatively thick surface coating and maintain reasonable sensitivity. Fibreglass coatings up to 6mm thick on 6.32mm thick floors have been inspected and 20% wall loss detected. MFL is less sensitive to floor surface condition that ultrasonics but heavily ribbed scale can cause false indications and corrosion products can build up on the magnet poles and then give false indications as they break away and pass under the sensor head. Generally removal of product and subsequent water jetting of the surface is sufficient. Pit depth is one of the main factors affecting flux leakage amplitude at a particular distance above the test surface. Volume and contour also affect this amplitude and these are discussed below. However within prescribed limitations the amplitude of the flux leakage field can be used to assess the percentage wall loss and thus reduce the amount of cross checking needed. It has been claimed elsewhere that the volume of the pit is the most significant factor affecting signal amplitude and for this reason it is claimed that no quantitative information about the pit can be deduced from the MFL results. Since the claim mostly appears as a bald statement we decided to carry out a study of the effects of volume and depth using modelling techniques and some empirical trials on real corrosion. A series of models of pits of given depth and varying volumes were produced. The results for depths of 40%, 50% and 60% pits in 6.35mm plate are shown at Figure 11. These show that as the volume increases its affect on signal amplitude decreases. This suggests that for typical tank floor corrosion of the cone and lake type it should be possible to "band" corrosion severity with reasonable accuracy using MFL alone. Pipe - like pitting such as that encountered with Sulphur Reducing Bacteria attack, however, are likely to give inaccurate results because the volumes will correspond to the region where the curves in Figure 11 converge. Very often people producing test plates with machined pitting choose simple shapes such as flat-bottomed holes (borrowed from ultrasonics) or simple conical impressions using drill bits. It has been shown that the contour of the pit will affect the leakage field. Since corrosion pitting usually progresses in such a way as to produce "terracing" in its profile, we have used artificial pits for calibration purposes that mimic the terracing as shown in Figure 12. These have been used to calibrate the MFL system used in the empirical results shown below. As with other NDT methods, human factors must be considered in assessing probability of detection. Especially in the case of storage tanks, the environment is not friendly! The interior of the tank is dark, dirty and has the lingering smell of the product. It can at times be extremely hot (+50°C) or extremely cold (-20°C) depending on location and season. It is therefore essential that the demands made on the operator are as light as possible. However, the operator must also ensure that the equipment is maintained in the best possible condition and that the calibration routine is carried out with precision. The probability of detection of pitting using the MFL is high within certain limits. With well-maintained equipment, trained and conscientious operators working on clean unpitted scanning surfaces on material thicknesses up to 10mm thick losses of 20% (sometimes as low as 10%) can be reliably detected. On less clean surfaces and on thicknesses up to 13mm 40% losses can be detected. Within these limits MFL is able to scan at speeds around 0.5m/sec with scan widths from 150mm to 450mm wide. The method is less influenced by surface condition than ultrasonics and for most MFL systems less operator dependant. The probability of detection of corrosion pitting using the ultrasonic method is also dependent on many factors. Because the method is rather slower than MFL, it was common practice until recently to use spot checks on a grid pattern in the same way that was used for erosion detection on pipe bends. Clearly the probability of detecting isolated pitting using this technique is negligible. Area scanning is now preferred and can be applied manually using contact scanning or using automated scanning with water irrigated probes. 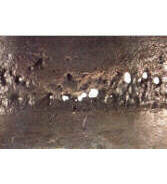 The reflecting surface that is offered by typical corrosion pitting is often poor for ultrasonic purposes and the operator needs to be able to see the character of the signal to avoid errors. For this reason simple digital thickness meters are not suitable for corrosion detection. Equipment with an A-Scan presentation is preferred and this can be complimented by B-Scan and C-Scan facilities. As with the MFL, the factors affecting POD with Ultrasonics include those that relate to the equipment and technique and those that relate to the floor and any pitting that may be present. As a minimum it should have an A-Scan display but the use of data storage techniques with facilities for producing both C-Scan and B-Scan images greatly enhances the probability of detection. In particular, these facilities demonstrate that continuous coupling has been achieved during the inspection. In many cases the thickness of material being examined is less than 10mm and the scanning surfaces are not completely smooth. This means that the initial pulse of single crystal transducers will occupy a significant portion of the nominal thickness so these transducers are not suitable. Twin crystal (Dual) transducers overcome this problem but it must be remembered that the optimum distance at which the maximum amount of transmitted energy is able to be captured by the receiver is a function of the probe design. Figure 13 illustrates this and shows clearly why reflectors below this distance will give reduced amplitude signals even when the reflecting surface in question is flat and parallel to the scanning surface. The operator should be aware of this possibility especially as corrosion pits are not ideal reflectors and should be prepared to vary the gain when backwall echoes are 'lost'. The rough surfaces encountered will rapidly wear Perspex shoes and change the beam angle so it is necessary to fit a wear ring to the probe. The crystal size should be between 10 and 15 mm diameter. Two methods of coupling ultrasound to the material are in current use. For manual scanning the contact method is used, whilst for automated and semi-automated scanning, water irrigation is preferred. In either case it is essential that the couplant is able to 'wet' the surface. Suitable gels are available for manual scanning and for water irrigation it may be necessary to add a wetting agent (soap). It should be obvious that taking spot readings on a grid pattern is only suitable for detecting areas of general corrosion and is useless in detecting isolated pits. Therefore it is necessary to use an area scan technique with a suitable overlap to ensure coverage by the effective area of the probe. With manual scanning it is better to use a fairly rapid probe movement with suitable calibration than to use a slow painstaking approach to the detection phase. This is because the human eye naturally responds to a sudden change (movement) in signal pattern. Once the pit has been detected, a more careful investigation of pit depth can be carried out. For the detection phase of the inspection when using manual scanning, it is better to calibrate the flaw detector on the actual test material by selecting an area on the floor where the thickness is known to be at the nominal plate thickness. The timebase is then set to display 3 backwall echoes positioned at 3, 6 and 9. The gain should be set so that the third backwall echo is at 80% full screen height. With this arrangement, using the fast scanning movement described above, loss of couplant will show as a vertical drop in all three echoes. The presence of a pit will show as a progressive loss (3rd then 2nd and then 1st echo) coupled with a general movement of the signals towards zero. With practice the eye becomes well adapted to recognise these patterns. The detection of corrosion pits is more difficult than simple thickness measurement or the detection of laminations or erosion. The slow scanning technique, with a timebase calibrated to display only one backwall echo, used by some operators is prone to miss pits that have poor reflectivity such as the conical types. Operators often say that they 'lost' the signal due to poor scanning surface when they have just encountered a pit. Specific training and experience is required for corrosion detection. Thinner wall thicknesses present the main difficulty when using the ultrasonic method. Below 6 mm the signal from a good reflector is reduced as described above and shown in Figure 13. The operator must be aware that more gain will be required. For thicker sections (above 12 mm) the ultrasonic method is far less restricted than MFL, however the POD limitations with respect to shape and reflectivity of pits still apply. The ultrasonic method is much more sensitive to the condition of the scanning surface than is the MFL method. This applies to both contact scanning and irrigated 'gap' scanning. Reflections in the couplant layer create 'noise' that obscures part of the timebase as shown in Figure 14. Since the velocity of sound in the couplant is about one quarter of the velocity in the material, top surface pits may give clear echoes that appear to show a reduced wall thickness. Figure 15 illustrates a lake type pit 1 mm deep. The echo from the bottom of the pit appears at a steel thickness of 4 mm. If unnoticed the operator may report a 6mm deep underfloor pit in a 10mm plate (60% loss). The same pit is likely to be misinterpreted with automated and semi-automated systems whether or not they use interface triggering and/or echo-to-echo monitoring. Painted and epoxy coated floors in which the coating is in good condition and has been applied from new present few problems to ultrasonic inspection and pit detection. The accuracy of measurement of remaining wall thickness is improved if the echo-to-echo method is used to eliminate paint thickness errors. Thicker, fibreglass coatings present more of a problem. Although in theory it may be possible to inspect through such a coating if the adhesion to the metal surface is good, it is seldom suitable for inspection. The easiest pits to detect are the lake type because in the deepest region they are relatively parallel to the scanning surface and can be expected to give reasonable reflectivity. On the other hand the conical pits tend to reflect sound away from the receiver and the centre of the pit is often too small in area to give a strong signal (Figure 16). These are the pits that are most likely to be missed by the ultrasonic operator. Often one of the 'terrace' facets is the strongest reflector and the pit is detected but its depth is underestimated. Pipe like pits such as those typical of SRB attack present very small targets to the ultrasonic beam and may also be as difficult to detect. Where the reflectivity of the pit is favourable, the ultrasonic method is capable of detecting smaller changes of thickness than the MFL method but, since the corrosion allowance is often as much as 50%, this advantage is not always significant. On good scanning surfaces the probability of detecting Lake Type pits is high. For poor scanning surfaces and for Cone Type pitting, the probability of detection is less satisfactory. To some extent the POD can be improved using the automated techniques with data storage and at least a C-scan presentation using colour coding to 'band' thickness. Some sections of floor were cut from storage tank bottoms after MFL inspection. Sections were taken from areas where underfloor corrosion was reported and also from areas where there was said to be no corrosion that was deeper than 20%. Some of the sections had been inspected using the Silver Wing 'Floormap' system that produced a map of the floor with colour coded indications of corrosion, each colour representing a 'band' of percentage wall loss. The corroded sections were subjected to mechanical pit depth measurement and the results compared with the MFL report. The pitting included both lake and cone examples. The approximate locations of the pits were marked on the opposite side of the plates (scanning surface) and two teams of UT operators were asked to locate the pits and measure their depth. 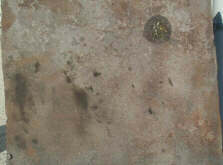 Figures 17 to 21 are photographs of some of the corrosion detected. Figures 22 and 23 are graphs showing actual pit depth against reported depths for the two UT teams. Figure 24 show the same for the MFL results. It can be seen that on average the MFL system overestimates the depth of pitting by about 10% whereas the ultrasonic method has underestimated by about 10%. However one UT team missed two of the pits even though the approximate location had been marked. Both methods have limitations in the thickness range that can be reliably inspected and the smallest pit that can be detected. Within the limitations described for MFL, the probability of detection of isolated pitting is better than ultrasonics and the method is also quicker than ultrasonics so more economic. In terms of accuracy of depth measurement, both methods have the same percentage error though in opposite senses. Since there is a remote chance that the floor material may not be mild steel and thus may have a permeability that differs from the calibration plate, it is always necessary to carry out at least limited cross checking of MFL results with UT before relying on MFL depth assessment.